We’ve been having a lot of discussions with clients lately about the importance of having a mobile friendly website. Have you thought about how your customers are using their phones and what that could mean for your business? 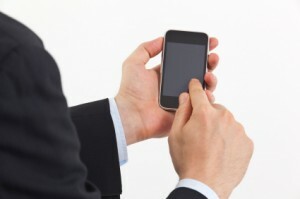 Did you know that 7.96% of all web traffic in the U.S. is from mobile devices? That might not sound like a particularly staggering statistic, until you consider this: in 2009 only 0.7% of web traffic was mobile. That’s more than 1000% growth. Some are even projecting mobile web traffic will overtake desktop traffic in as little as two years. A revolution is underway, and if your website and overall strategy isn’t evolving, you’re going to be left behind. Optimizing your website for mobile traffic now will pay huge dividends in customer experience and building your brand’s identity. By improving the user experience of your website for smaller screens and improving download speeds, you will be showing your customers that you value their time and attention. A recent survey showed that 74% of consumers will wait only five seconds for a page to load on their device. 46% say they probably won’t return to a site that didn’t work well the last time they visited. Realistically or not, the simple fact is most people expect web pages to load as quickly on their phones as on their desktops, and the consequences are steep for websites that don’t. Your website is the center of your brand identity online, and doing all you can to create a positive experience for your customers is essential to building that identity and growing your business. Having a mobile site has been shown to help online and traditional retailers. Consumers are 51% more likely to purchase from an online retailers with a mobile friendly site, and 88% of mobile users say they are more likely to do business with an auto dealer whose site is optimized for mobile users. When you make it easier for your customers to access your content, you strengthen your brand identity. Creating a mobile friendly and optimized website also builds customer connection. Utilizing click to call, mapping, and location aware technology are all ways your site can make it easier for your customers to connect. When the overwhelming majority of people have their mobile devices within easy reach all the time, why wouldn’t you want to take advantage of any technology that kept your company just a click away 24/7? Your social media strategy is a natural fit with mobile optimization. 91% of mobile internet use is for using social networking sites like Facebook and Twitter. If your social strategy directs customers to a site that loads slowly or is hard to read on a small screen, you are hurting your brand and losing customers. By having a mobile friendly website, your customers are getting a message before they read a work: you’re there for them anytime, anywhere. By having a mobile optimized site, you will be able to improve your Calgary SEO rankings on search engines like Google and Yahoo, and you will also gain access to a steadily increasing number of local directories. Additionally, if your company uses Google AdWords or other pay-per-click networks, your ads are likely appearing in mobile ads. Wouldn’t you want these potential customer directed to a site that was easy to read and loaded quickly? The reality of a steadily increasing, if not dominant, mobile web is inevitable. By optimizing your website to be as mobile friendly as possible now, you stand to gain a significant competitive edge. With a mobile website that loads quickly and easily to read, you can capture people’s attention and give them the value-added content that they crave.